The exhibition is the result of a series of workshops organized by the Muzeum Sztuki and the Strzemiński Academy of Art Łódź. 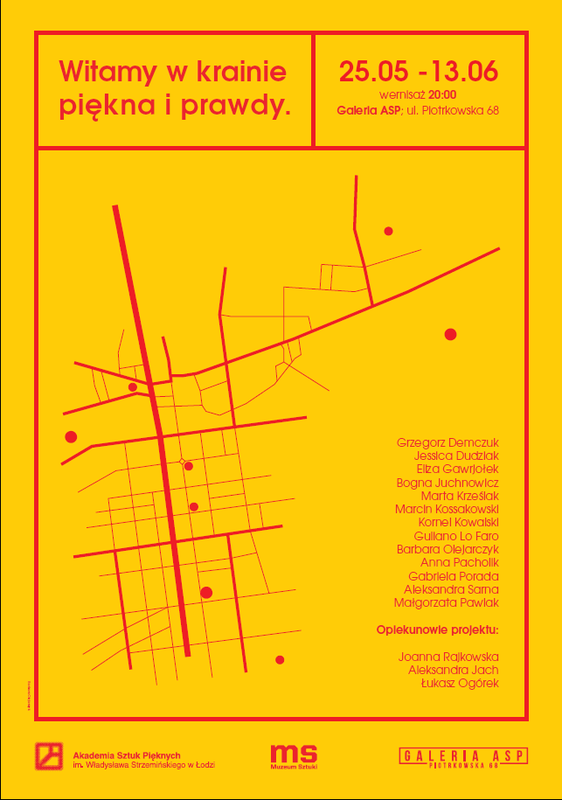 Its third edition is devoted to the city. This year students have cooperated with Joanna Rajkowska, who, for many years, has been involved in working on public projects and their implementation. This year's workshop’s main aim was to show the documentation of a public project in a creative way, so that it would become an independent work of art. Such a work, isolated from its original, was to become a self-sufficient narrative, a model or a ‘skeleton’ for the most important themes of the whole project that took place in a particular place in Łódź. Łódź, a unique and proverbial city, was the starting point for this cooperative work. Łódź has not been an industrial city for a long time. Nor is it The City of Four Cultures any more – if anything now – perhaps it is a city of a number of new minorities. The slogan of being the capital of creative industry has not been accepted either. The artists, in other words, people who are sensitive to micro stimuli, avoid stereotypical narratives about the city. They come from specific spaces, such as home gardens or the walls of tenement houses in the Bałuty district with bottles smashed into them. Their work is a harbinger of what we may experience when we go free drifting around Lodz. With an open mind and no script. Welcome to the Land of Beauty and Truth. Both beauty and truth, warmth and irony create the vision of the city seen ‘from below’. The students, without exception, followed the disappearing or invisible traces of micro- and macro-cosmos of Łódź : from the sounds hidden in the rivers, through the frightful backyard sceneries imitating paradise, to performative, physical choreographies evoking the forgotten heroines from the history of Lodz.